It's a fund raising event & registration was full in a matter of days! 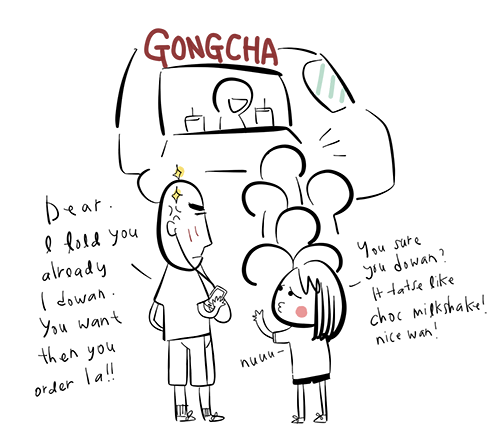 Though, I have a feeling half the people came (of course not only to support the walk) but also for gong cha hahahaha! Only a few serious ppl will actually bother to do some real exercise or something ba. Like ah pek lor... *cough* ran 9 *cough* rounds. 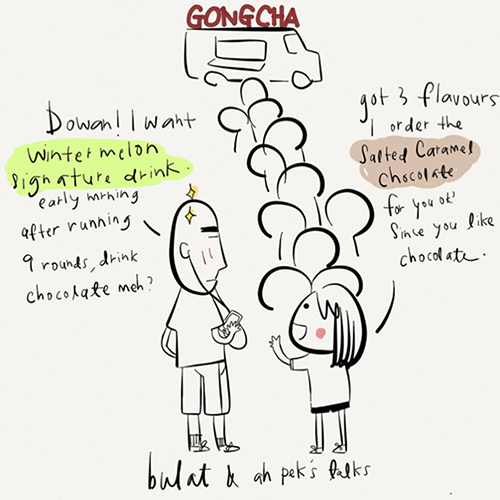 The main point / highlight was definitely the gong cha truck with the free gong cha drink that was in the goodie bag. Long (ugly) drawing cut short. 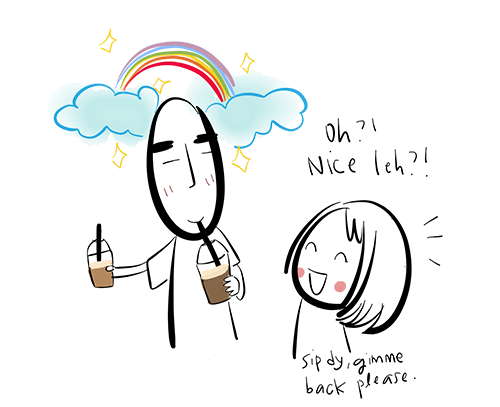 In the end diedie also don't want to give my drink back to me!! 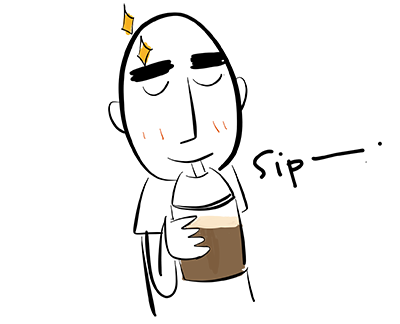 I fought for it ok.
Made him sipped faster only. Summore I so short. How to reach?! So I'm stuck with his winter melon drink. 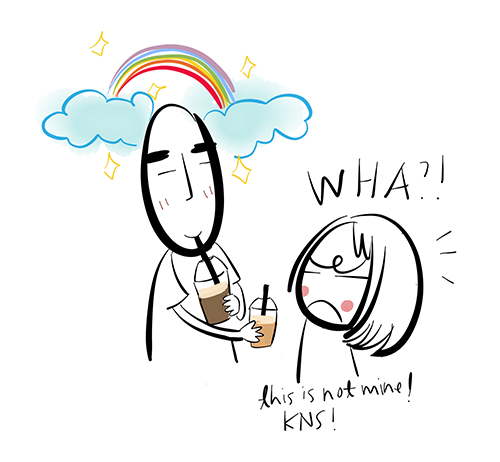 Those comic drawings are so cute... You created them? Thumbs Up! so cute!!! :) Happy to finally able to meet you in person on that day after how may times dealing on the net :) you are doing good job handling the registration <3 Arigato! I got 2 too! grapefruit & choco. 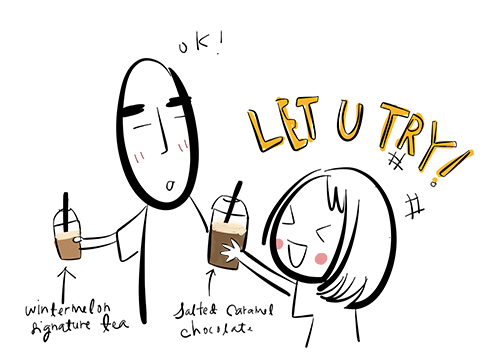 I never tried those like Salted Caramel Chocolate! Illy Ariffin: Thank you!! you were so patient & kind to me! Your lil baby girl is sooo cute!!! Jots Dots : wow! Goes well with snack?! hahah next time i will do that! Tammy Miu: hahah i love buttons!